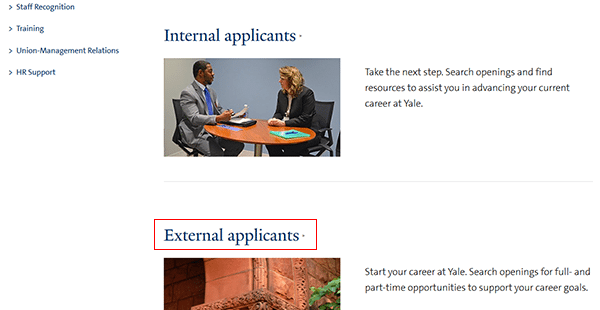 Go to the University’s main careers/employment website to access the official Yale job application. External, internal, and temporary applicants can all search/apply for jobs on the employment site. Read the instructions posted below to learn how to search for current job opportunities, create an online profile, and complete the application process. About the Employer: Yale University is a private research university located in New Haven, Connecticut. The school was established in 1701 has currently enrolls more than 10,000 students (total) per year. Yale employs more than 4,000 academic staff members. Step 1 – The first step of the online job search process is to go to the Yale employment page. Press here to open the employment page. Step 2 – Scroll down the page and click the proper link according to the type of applicant that you are (i.e. external or internal). Note: This guide details how to search/apply for jobs as an external applicant. Step 3 – Click the “Search Openings” link. Step 4 – Press the link as outlined below to go to the main job search form. Step 5 – Compete the search form and then hit the “Search” button to load the results. Step 6 – Click the “requisition number” link of the job that you want to apply for to learn more about the role’s responsibilities, requirements, etc. Step 7 – Press the button as outlined below. Step 8 – Agree to the authorization and release. Step 10 – After your account has been created you will be taken to the main application page/form. Submit all of the required details into the form until you are able to submit it for processing.